Dr. Kuluski is an Investigator at the Lunenfeld-Tanenbaum Research Institute, Sinai Health System (Bridgepoint Hospital site), Assistant Professor at the Institute of Health Policy, Management and Evaluation (University of Toronto) and Research Affiliate at the Centre for Education and Research on Aging and Health (Lakehead University). She is an Applied Health Services Researcher and a Social Worker by training. She received her PhD in Health Services and Policy Research from the University of Toronto in 2010 followed by a Prestigious Postdoctoral Visiting Fellowship at the University of Oxford where she worked with the Health Experiences Research Group. She is the recipient of several extra-curricular leadership awards, a Literary Award in Health Services Evaluation, Co-Investigator on over 7.5 million dollars in externally funded research, has given over 50 invited talks and has over 20 publications in peer-reviewed journals. Her current research focuses on quality and health system performance through the eyes of people with multimorbidity and their caregivers in the contexts of community based primary health care, homecare, hospital care, delayed discharge and transitions between care settings. She draws on both quantitative and qualitative methods to uncover population level trends in care utilization as well as patient and caregiver experiences in the health care system. Her ultimate research goal is to use the patient and caregiver experiences to inform quality improvements in the health care system including approaches to care delivery that are more family centred. At the University of Toronto she teaches a foundational course on Canada’s Health Care System and supervises a number of Masters and PhD students. Introduction: A growing number of people are living with complex care needs characterized by multimorbidity, mental health challenges and social deprivation. Required is the integration of health and social care, beyond traditional health care services to address social determinants. This study investigates key care components to support complex patients and their families in the community. Methods: Expert panel focus groups with 24 care providers, working in health and social care sectors across Toronto, Ontario, Canada were conducted. Patient vignettes illustrating significant health and social care needs were presented to participants. The vignettes prompted discussions on i) how best to meet complex care needs in the community and ii) the barriers to delivering care to this population. Results: Categories to support care needs of complex patients and their families included i) relationships as the foundation for care, ii) desired processes and structures of care, and iii) barriers and workarounds for desired care. Discussion and Conclusions: Meeting the needs of the population who require health and social care requires time to develop authentic relationships, broadening the membership of the care team, communicating across sectors, co-locating health and social care, and addressing the barriers that prevent providers from engaging in these required practices. Millions of people worldwide have complex care needs [1, 2, 3] resulting from multiple concurrent chronic conditions, functional and cognitive impairments, mental health challenges and social vulnerability . Illness has a significant impact on the lives of individuals, over and above managing treatments and medicines  including social participation, relationships and societal contributions . Despite the growing numbers of people who present with complex health and social care needs, health systems continue to deliver care that predominantly focuses on one illness at a time or prioritizes medically oriented care (management of disease and symptoms) over socially oriented care (attention to quality of life and social support). There is widespread consensus that improving care for people with complex care needs requires integration of health and social care services [7, 8]. The need for such integration becomes more apparent at particular points of a person’s care journey, especially as they transition from one care site to another. For example, when preparing for hospital discharge, the mobilization of both health care services (such as nursing or home physiotherapy) and social care services (such as assistance with instrumental activities of daily living or making adaptations to the home environment) may be required to support ongoing care needs. Failing to mobilize health and social care in the community may result in a hospital discharge delay [9, 10, 11, 12, 13, 14], and once discharged home could result in hospital readmission [15, 16]. Mobilizing health and social care in the community has proved challenging in the study context (Toronto, Ontario, Canada) as well as other jurisdictions worldwide, partly because homecare services tend to be medically oriented. Supports for nursing care, physical rehabilitation and activities of daily living (bathing, toileting and personal hygiene), are more likely to be publicly funded entitlements for those who meet specified eligibility criteria. On the other hand, instrumental activities of daily living (IADLs) such as: meal preparation, transportation, paying bills, partaking in social activities, and home maintenance, are only partially (or not) subsidized by the government. Moreover, some patients find services to be inaccessible due to factors such as cost or location. Receiving care may be contingent on the presence and capacity of family and friends to connect them to services or provide it directly. To further complicate matters, patients may find themselves needing support for public programs that lie outside of health care entirely, including workplace reintegration, obtaining or maintaining adequate and affordable housing, making home adaptations, and seeking financial support. While these types of services are situated outside of health care they are inexplicitly tied to one’s ability to maintain overall health. Since there is no standard definition for “social care” we define it in this paper as services outside health care as well as services to support IADLs. Importantly, the absence of needed social care has been linked to increased use of inappropriate medical care, which is both unnecessary and typically more expensive . There remains a poor understanding of what optimal care in the community entails for people that present with significant health and social care needs, particularly when needs span beyond what the health care system typically provides. As a start, it is important to garner the perspectives of experienced health and social care providers, who work with this population, to gain insight into what community supports are needed and what gets in the way of providing them. In this study we presented health and social care providers with composite patient vignettes characterized by significant health and social care needs, nearing hospital discharge. The vignettes were used to guide a discussion on i) how best to meet the needs of people with complex care needs in the community and ii) the barriers experienced when trying to deliver care to this population. This study is the second phase of a two-phased sequential mixed methods design . In the first phase a series of patient vignettes (composite descriptions), based on previously conducted patient interviews  were created. Vignettes have been used previously in health services research to outline patient characteristics and prompt discussion around decision making and care planning with expert participants . The vignettes featured a range of complex patient cases across young adult (18 – 44 years of age), mid-life (45 – 64 years of age) and older adult age groups (65 years of age and above), with a variety of health and social challenges. As noted above, the creation of the vignettes was informed by a previous study led by the lead author. In this original analysis patient experience appeared to vary by two key factors: illness trajectory (sudden illness or ongoing illness) and life circumstances (related to age/stage of life, social, financial, practical, and other non-bio-medical circumstances). To create the vignettes, the full set of interviews was categorized by illness trajectory and age group (young, mid-life and older) and a sub-set of interviews were selected from each category for additional in-depth analysis. Patient vignettes were created to reflect the patterns that emerged from this analysis as opposed to individual cases (so that confidentiality of patients could be protected). These vignettes were subsequently reviewed and approved for content by health and social care providers at Bridgepoint Active Healthcare (an intermediate care facility providing complex continuing care and rehabilitation located in Toronto, Canada) in preparation for this current study. The full vignettes are available as an appendix and a summary can be viewed in Table 1. Further details of how the vignettes were designed are outlined in a report that was published online . The current study entailed two in-depth expert panel sessions (similar to the structure of a focus group). An environmental scan of organizations that deliver health and social care in the community in the Greater Toronto Area of Ontario was conducted to identify the sampling frame. Searches for organizations were conducted from January to February 2016 using internet sources including the Community Navigation and Access Program (www.4seniors.org), Canadian Research Network for Care in the Community (http://www.ryerson.ca/crncc/), and Toronto Central Health Line (www.torontocentralhealthline.ca). In addition to an environmental scan, a snowball sampling strategy was conducted, that consisted of asking the Professional Practice Leader for social workers at the aforementioned intermediate care facility that serves a complex patient population, to identify providers who work as care coordinators or direct care providers for people with complex care needs. The project manager for a hospital discharge program at the same site was also asked to provide a list of contacts. The environmental scan and snowball sampling strategy resulted in a list of providers from a variety of settings including: acute and rehabilitation hospitals, homecare, housing with care (supportive housing/assisted living), primary care, mental health, other community support services (such as meals and transportation), as well as mental health, legal and workplace integration services. Email invitations from the research coordinator detailing the study purpose were sent to 71 providers who were given two options (meeting dates) to participate. 24 responded and agreed to participate, 13 declined and 34 did not respond to either the initial or follow-up invitation. This study received ethics approval from the Mount Sinai Hospital Research Ethics Board. All ethical requirements were adhered to throughout the study and consent was received from participants prior to the initiation of study activities. Each expert panel session was approximately 3 hours in length. Participants received printouts of the 7 case vignettes which were used as prompts to guide the discussion on the resources required to adequately support patients with complex care needs in the community following hospital discharge, as well as related barriers. The sessions were audio-recorded and led by the lead author (KK), a trained and experienced qualitative researcher who has facilitated expert panel sessions and focus groups with care providers in the past. Two members of the research team (JH and PH) took extensive notes during the session as a supplement to the audio-recordings. Qualitative content analysis activities were implemented. The audio-recordings were transcribed verbatim. The lead author removed identifying information and checked the transcripts for accuracy against the original audio-recordings. To ensure trustworthiness of the data, three members of the research team (KK, JH and PH) reviewed the transcripts independently and made note of key categories (e.g., data derived codes). The team members coded the transcripts inductively, in order to capture the range of categories identified by the participants . Following independent coding, the team met to discuss, map out, and compare categories that emerged across the two focus groups and iron out discrepancies. A consolidated codebook was created and verified by each team member. Next, the lead author coded both transcripts using NVivo 11 software to organize the findings. After both transcripts were coded using this codebook, the lead author compared, aggregated, refined, and organized the codes into higher-level descriptive categories. A total of 24 health and social care providers participated in one of the two expert panel sessions (10 and 14 participants in the sessions respectively) that took place in February 2016. The large number of participants in each group allowed for greater variation in participant characteristics, supporting maximal variation of participant perspectives. Table 2 provides a summary of participant characteristics. 1 includes occupational and recreational therapy, law, education, and midwifery. 2 includes some combination of housing, daily living and social supports. 3 includes acute care and post-acute/rehabilitation. 4 includes homecare, legal services, mental health and addictions, aboriginal health. 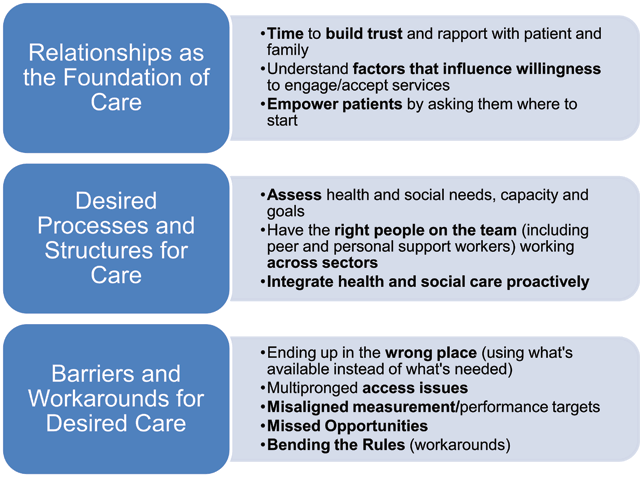 The three broad categories of results with corresponding elements that were determined from both expert panel sessions and across multiple composite vignettes included: i) relationships as the foundation for care, ii) desired processes and structures of care, and iii) barriers and workarounds for desired care. These categories are outlined in Figure 1. We describe the corresponding components of each of these categories below with illustrative quotes. While the illustrative quotes were often pulled in response to specific vignettes, the categories surfaced across all vignettes, and thus appear to represent general fundamental components of care for complex patient populations. Key Categories Identified by Health and Social Care Providers in the Care of People with Complex Care Needs. Integral to the care of people with complex care needs was the establishment of a strong therapeutic relationship. The development of trust between care providers and care recipients was essential, but required time which was often in short supply. One of the participants noted that a strong relationship with the client could serve as an entree to their receptivity to services. This category included the tangible components of care including: a comprehensive assessment of the needs and decision-making capacity of patients, optimization of the structure, members and roles of the care team, support for formal and informal caregivers, and an appropriate continuum of services delivered proactively. Incorrectly determining capacity could have repercussions for the patient (who may overestimate their ability to manage their care needs), as well as the family (if available) who may be left with significant care responsibilities. Regardless of the capacity or decision making preference expressed by the patient, providers felt that it was important for the patient to be “at the table” when decisions were being made. At times, regardless of capacity, patients deferred decisions to family. When sibling conflict arose over care choices and settings, regular family meetings and discussions with the patient present was suggested as a means to help ameliorate these misunderstandings. Giving the strain that is felt by both formal and informal care providers, the participants emphasized the need to support and enhance the capacity of both parties. To ensure that the “the wheels don’t fall off,” participants noted the team needed to coordinate care across the various sectors (hospital, community, etc.) used by the patient. Finally, participants emphasized the utility of col-locating health and social care services. The participants reflected on existing programs that were structured this way and worked well. These included primary care practices with legal services embedded within or housing models (apartment buildings) with care services on site. Participants remarked that although these types of socially oriented and co-located programs were ideal, they had limited capacity, strict eligibility requirements, and lengthy wait times. Participants described perverse practices, policies, and rules that limited the extent to which therapeutic relationships could be developed, services accessed and integrated, and client needs met. These barriers were experienced in every day practice and limited provider’s aspirations for integrated health and social care detailed in the aforementioned categories. Participants shared unfair and discriminatory practices, particularly toward people with mental health and addictions issues. These patients, were at times, denied access to services such as assisted living or supportive housing (housing with care supports), given concerns among landlords of unpredictable behaviors and unpaid rents. Participants felt that there were few regulations in place to prevent or address such occurrences. When patients lived in poor living conditions (e.g., characterized by hoarding and bed bugs), providers could opt out of providing a home service because of workplace health and safety concerns. Finally, participants noted that patients and providers (including themselves) did not know the full complement of services available or how to access them. Having an up-to-date, reliable repository of information (such as a website) with clear descriptions of services, guidelines on how to access them, and their eligibility requirements was recommended. Providing service for certain populations was challenging (e.g., family caregiver support) due to narrowly defined service codes that were linked to provider/organization reimbursement. This study brought together a range of experienced care providers to examine and discuss the ‘fundamentals’ of community-based care for people with complex health and social care needs. The discussion itself and the categories of data that evolved provide a framework for the design of interventions and programs for people with complex care needs. Additionally, this study highlights the myriad of “workarounds” and the lengths that health and social care providers go to in their work with patients and families. Participants spent a considerable part of the discussion emphasizing how care should be delivered. They emphasized the need for strong therapeutic relationships supported by consistent care providers and time; necessary elements to develop trust and openness to care options. These insights are consistent with frameworks of person and family centered care; frameworks which have gained increasing attention as a core domain of care quality since the release of the Institute of Medicine’s seminal report . A growing body of research on persons with complex care needs sheds light on continued challenges in achieving person centeredness in practice including poor communication with providers and low continuity of care . Our study adds important insights into the concept of person centeredness, particularly the types of things that need attention when engaging patients and families. Determining patient capacity to make decisions, working with families to resolve conflicts and make care decisions, as well as unpacking a person’s culture, social role, and previous experiences is required to understand factors that shape peoples willingness to engage in care planning. Empowering patients through choice of service, location of care, unpacking personal goals and priorities, and allowing time for this process was strongly encouraged; but represents a departure from our current medical care system, which prioritizes short episodes of care delivery, provider driven care decisions, and rewards efficiency and cost-effectiveness in service utilization. Participants outlined a number of processes and approaches that would enable better care for people with complex care needs. As a basis to care, a comprehensive assessment was recommended. While many tools to assess patients are utilized across different programs and settings we reflect on one example due to its widespread international use; the internationally suite of Resident Assessment Instruments (RAI) developed by interRAI research collaborative. These tools are used in a variety of health settings across the world, including the study context, to assess the bio-psycho social characteristics of clients. A Canadian study by Kontos  noted that the RAI tools do not account for patients personal preferences or the important insights of Personal Support Workers who interact regularly with them, leading to implications for care quality. Furthermore, the more nuanced aspects of client needs and characteristics (including culture, expectations, goals, etc.) are missing in a formalized manner from standard care assessments such as the RAI. As noted by Turcotte et al  properly assessing and addressing health and social needs is necessary to meet the ongoing care needs of this population. A recent synthesis of European evidence on care for patients with complex care needs , noted that an appropriate assessment of risk inclusive of non-medical factors is required. Ignoring social risk factors have real implications, as noted by the participants in our study, who indicated that overlooking social needs may culminate into a missed opportunity to mitigate a medical crisis later on. Beyond assessments, members of the care team need to be appropriately supported and equipped to work effectively with persons with complex care needs and their caregivers. For instance Woo et al  in their study on older adults and service providers in Hong Kong, identified a need for educational opportunities for providers to become more skilled in sensitively managing the psychiatric comorbidities of patients. Further, Foust et al  shared how providers lacked preparation and attention to caregiver needs during transitions from hospital to home. There is a broad base of literature supporting the need to effectively communicate and coordinate care across sectors. Davis et al  found that a lack of communication between members of the care team, as well as across settings, led to poorly executed transitions and negative patient and provider experiences. They recommended clarifying the accountability of team members, standardizing the transition process through multidisciplinary hospital rounds, and training additional medical staff. Our findings supported this and suggested that unregulated care providers and peer support workers be included as members of the care team. Personal Support Workers are unregulated care providers who provide the majority of home and community care in the study context, but are typically undervalued, precariously employed, and overburdened with care responsibility with few (if any) linkages to a broader team of care providers. In terms of peer support workers, there is strong evidence in the mental health literature on the value of this role, particularly, the authenticity of linking two people with a shared experience and associated good outcomes . Finally, the burden and shock of a care transition can be eased through an interim care option. Participants described “temporary” assisted living as a way to ease a difficult transition, or on the other hand, gradually acclimatizing someone accustomed to a higher level of service such as facility based long-term care. This type of transitional setting is akin to the Australian Transition Care Program  which offers housing with supports as an “in-between” and realistic “life at home” set-up following a hospital stay and prior to returning home. Support for ADLs and IADLs after people have returned home is important to ease the transition, and additional work to identify, examine and implement innovative models to support patients and their families post discharge is required. Importantly, meeting the needs of people with complex care needs requires careful consideration of policy levers and organizational arrangements. Care provider’s work within structures guided by rules, policies, accountability and reporting requirements that effectively shapes and often limits what’s possible in their day to day interactions with patients, other providers, and families. Moving beyond these boundaries or “working the system” becomes necessary in order to meet the unique and fluctuating needs of people with complex care needs, but may be coupled with feelings of dissatisfaction and moral distress . International health systems are strongly advocating for the integration of health and social care, particularly for sub-groups of patients who stand to benefit the most, including those with multimorbidity and complex care needs. This literature highlights the enablers and disablers of such integrated approaches. A recent paper by Maruthappu et al  outlined enablers to integrated care including infrastructure for information technology, clinical leadership, the involvement of primary care, a culture shift, accountability and governance, which spans over the full continuum of services as opposed to separate providers and sectors. Financial incentives such as pooled funding and appropriate evaluation and metrics, which support the integration of services, have also been recommended and align with our study findings. In this paper, we shed light on important nuances that need to be considered when successfully engaging with patients and families in day-to-day care. We highlight the potential utility of formalizing the often-overlooked roles of peers and Personal Support Workers, who play critical roles in meeting both the health and social needs of people, but are often devalued or restricted in their role on care teams. We outline concrete examples of perverse incentives that limit the extent to which providers can deliver on what patients and families need. We recommend that reforming models of care delivery towards ‘integrated’ systems requires the consideration of the complex interactions that care providers have with structural barriers, and the means they use to mitigate them. In this paper, people on the front lines have identified some key opportunities for future work and focus for the care and support of people with complex care needs, and our findings serve as a framework in this endeavor. While several participants across various health and social care organizations were contacted for participation several did not respond after two attempts. The researchers cast a fairly wide net in anticipation of a high non-response rate given the typically busy schedules of these types of providers. Despite a high non-response rate, the sample garnered perspectives from 24 health and social care providers with a wealth of experience working with complex patients populations. The providers were all from one major urban area and served culturally diverse clients of various ages. Findings, therefore, may be limited to similar geographic settings and client profiles. Despite this, the broad categories are likely applicable beyond the context of the study and will resonate with a range of providers who are seeking to integrate care for people with complex care needs and their families. Meeting the needs of people with complex care needs requires authentic and consistent relationships with providers and families and ongoing communication. Attention to non-medical factors including culture, personal goals and expectations, can also provide insight into care preferences and levels of engagement. Teams that recognize and support less formalized roles of families, personal and peer support workers, are critical to the delivery of supports to this population. This type of care delivery model, along with the mobilization of needed health and social care supports can be more effectively realized with the appropriate training, levers and incentives, in place at the organization and policy levels. Perhaps the greatest challenge is the persistent orientation of health systems toward acute and episodic care; equipped to react quickly to problems after they arise, and then move onto the next case. We offer some essential building blocks to address the health and social care needs of complex patient populations, but it will be much easier to put these components into practice within a system that is oriented to proactively supporting health and well-being. The authors gratefully acknowledge the 23 health and social care providers for dedicating their time and sharing their thoughtful views on how to improve health and social care integration for people with complex care needs. The study was funded by the Ministry of Health and Long-term Care Health Services Research Fund. The results reflect the views of the authors and not necessarily the views of the partner organizations and the funder. Ann Netten, Professor of Social Welfare, Personal Social Services Research Unit, University of Kent, UK. Prof. dr. Hubertus J.M. Vrijhoef. Saw Swee Hock School of Public Health & National University Health System Singapore, Singapore. Department of Patient & Care, Maastricht University Hospital, The Netherlands. Department of Family Medicine, Vrije Universiteit Brussels, Belgium. Lyons, R et al. (2010). Chronic illness research: Translating what we know into what we do In: Kralik, D, Paterson, B and Coates, V eds. Translating chronic illness research into practice. Oxford: Blackwell Publishing Ltd., pp. 163–197. Gilmour, H (2012). Social participation and the health and well-being of Canadian seniors. Health Reports, [cited 2016 October 29]; Available from: http://www.statcan.gc.ca/pub/82-003-x/2012004/article/11720-eng.htm. Falcone, D, Bolda, E and Leak, SC (1991). Waiting for placement: an exploratory analysis of determinants of delayed discharges of elderly hospital patients. Health Serv Res 26(3): 339–74. Tan, WS et al. (2010). Factors associated with delayed discharges after inpatient stroke rehabilitation in Singapore. Ann Acad Med Singapore 39(6): 435–41. Watt, S, Browne, G and Gafni, A (1999). Community care for people with chronic conditions: an analysis of nine studies of health and social service utilization in Ontario. Milbank Q 77(3): 363–92. 275. Creswell, J (2007). Creswell, J and Plano Clark, V eds. Choosing a Mixed Methods Design, in Designing and conducting mixed methods research. Thousand Oaks: Sage Publications, pp. 58–88. Nelson, M et al. (2014). “Working the system”: The experience of being a primary care patient. Patient Experience Journal 1(1): 37–42. Miller, D et al. (2015). Beyond Multi-morbidity: Patient Perceptions of the Impact of Illness. Evidence Brief, [cited 2017 April 21]; Available from: http://hsprn.ca/uploads/files/Beyond%20Multimorbidity_Evidence%20Brief_April%202015.pdf. Institute of Medicine (2001). Crossing the Quality Chasm: A New Health System for the 21st Century. Washington, D.C.: National Academic Press.